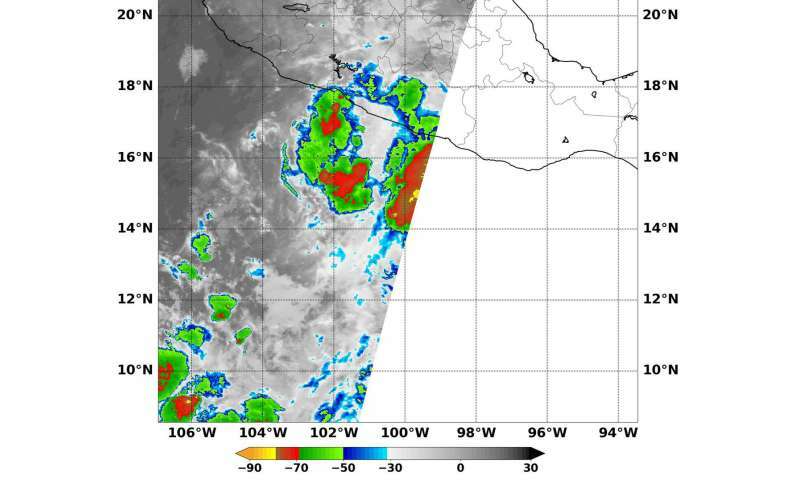 Tropical Depression 04E formed close to the coast of southwestern Mexico on June 14, and early the next day NASA's Aqua satellite passed over the region. Using infrared light, Aqua identified where the strongest storms were within 04E. Tropical Depression 04E formed on June 14 at 5 p.m. EDT about 100 miles (155 km) south of Acapulco, Mexico. NASA's Aqua satellite passed over 04E on June 15, 2018 at 5:05 a.m. EDT (0905 UTC) and analyzed the storm in infrared light. Infrared light provides temperature data and that's important when trying to understand where the strongest storms within a tropical cyclone are located. The higher the cloud tops, the colder and the stronger the storms. Infrared data from the Moderate Resolution Imaging Spectroradiometer or MODIS instrument showed coldest cloud top as cold as minus 63 degrees Fahrenheit (minus 53 degrees Celsius). Those coldest temperatures appeared in fragmented storms that were located northwest, southwest and southeast of the storm's center. All of those areas were over the Eastern Pacific Ocean and just offshore of mainland Mexico. Storms with cloud top temperatures that cold have the capability to produce heavy rainfall. After Aqua captured that data, Tropical Depression 04E continued to move toward the coast of southwestern Mexico, bringing those heavy rains to coastal cities. At 11 a.m. EDT, the National Hurricane Center (NHC) noted "the depression was producing torrential rainfall over Guerrero and Oaxaca." NHC's forecast calls for "the depression to produce 3 to 6 inches of rainfall along the Guerrero and Oaxaca coasts, including the city of Acapulco, with isolated higher amounts of 10 inches possible. These rains are likely to produce life-threatening flash floods and mud slides, especially in areas of higher terrain. Farther inland across the states of Guerrero and Oaxaca, rainfall amounts of 1 to 2 inches with isolated amounts of 4 inches are forecast." A Tropical Storm Warning was in effect from Tecpan de Galeana to Lagunas de Chacahua. At 11 a.m. EDT on June 15, the National Hurricane Center (NHC) said the center of Tropical Depression 04E was located near latitude 15.8 degrees north and longitude 99.7 degrees west. That's about 75 miles (125 km) south of Acapulco, Mexico. The depression is moving toward the north-northeast near 3 mph (6 kph) and a slow northeastward motion is expected to begin later today (June 15). Maximum sustained winds are near 35 mph (55 kph) with higher gusts. Swells generated by the depression are affecting portions of the coast of southern Mexico. On the forecast track, the center of the depression is expected to make landfall on Saturday, June 16 within the warning area and move farther inland on Sunday, June 17. The depression is forecast to become a tropical storm later today, quickly weaken after landfall on Saturday, and then dissipate on Sunday, June 17.